Note: Current Nikon D7000 price and cost trend / history was last updated on Sep 11, 2011. The price of most digital cameras tend to trend downwards over time, and the same price drop should occur in the case of the Nikon D7000 digital SLR camera. The D7000 was announced on Wednesday, Sep 15, 2010, and features a 16.2 MP (Megapixels), APS-C (1.5x crop factor) CMOS sensor, a Full HD movie mode with 1920 x 1080 (1080P, 16:9) @ 24 fps and 1280 x 720 (720P, 16:9) @ 30/25/24 fps capture capabilities. Approximate numbers for weight and dimensions (W x H x D) are 690 g / 1 lb. 8.3 oz. (camera body only) or 780 g / 1 lb. 11.5 oz. (with battery and memory card but without body cap), and 132 × 105 × 77 mm / 5.2 × 4.1 × 3.0 in., respectively. I’m not planning for any scheduled updates, but do check back here from time to time for the latest and best prices on the Nikon D7000 DSLR and related accessories. The D7000 is available as a body only, or as a kit (outfit) with the Nikon 18-105mm f/3.5-5.6G AF-S ED VR Nikkor lens. Price trend and comparison for Nikon D7000 16.2MP DX-format CMOS Digital SLR with 3.0-inch LCD body, body with the 18-105mm f/3.5-5.6 AF-S DX VR ED Nikkor lens kit, and lens only. At the time of writing, it’s cheaper to purchase the camera plus lens kit than buying each separately. Refer to Nikon D7000 Battery Life to help with your decision on whether to purchase additional batteries. The D7000 is powered by a single Nikon EN-EL15 Rechargeable Li-Ion battery (7.0 V / 1900 mAh), one of which is already supplied in the box. It’s a good idea to purchase a spare battery as a backup so that the camera doesn’t run out of power during extended shooting sessions. Nikon MB-D11 Multi-Power Battery Pack — This vertical grip takes one rechargeable Nikon EN-EL15 Li-ion battery or six AA-size batteries, and provide for a more comfortable portrait shooting experience and an extended battery life. Nikon MC-DC2 Remote Release Cord: $21.95. Third-party remote shutter releases are also available. Alternatively, you could opt for an IR (infrared) wireless remote such as the Nikon ML-L3 ($13.95), or third-party RF (radio frequency) remote control units such as the Phottix Cleon N10, Phottix Plato and Phottix Cleon II. 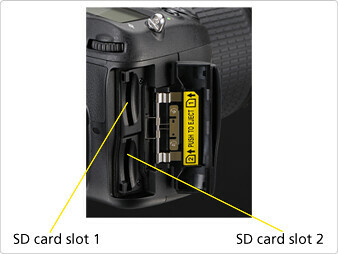 For storage, the D7000 uses SD, SDHC or the latest SDXC cards. The D7000 is the first Nikon DSLR to employ double SDXC-compatible SD card slots for extended storage versatility and capacity, so do plan your memory card purchases accordingly. While waiting for your D7000 to arrive, download and read the Nikon D7000 Manual to familiarize yourself with the camera’s features and capabilities. Some general pointers in Photography Tips might be of additional help. Good luck shopping for your D7000!